scrapbook paper, decoupage tissue, ribbon, fabric - whatever! Using the paper, tissue or fabric, I like to cut a rectangle (by eye, not measured) about twice as wide, and a smidge over the length of the first clothespin. Then turn it over and trace one side of the clothespin. Next to that tracing, flip the clothespin over and trace the other side. Cut those two pieces out, lay aside. 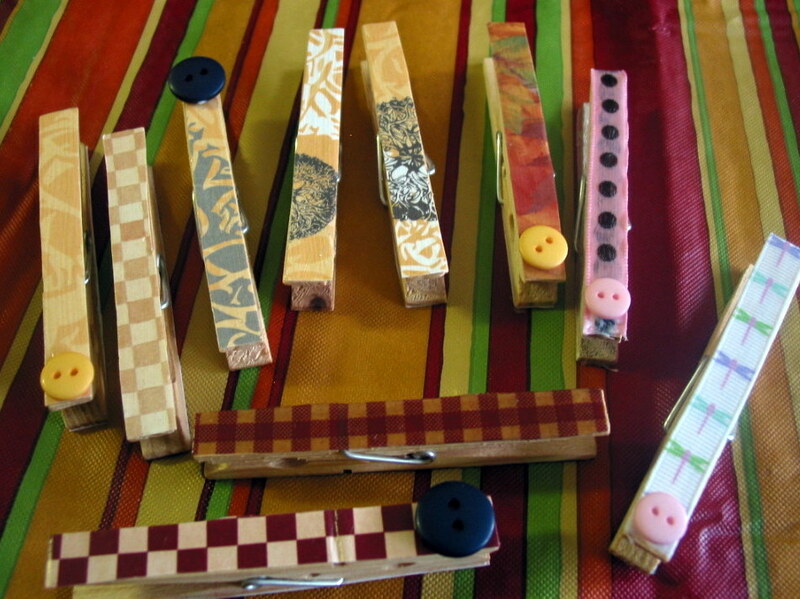 Do the same for each clothespin you want to cover. (Don't just cut the pieces all the same as the first pin - each pin differs slightly in size, width, etc. It takes more time, but the final look is better if you trace every one separately!) 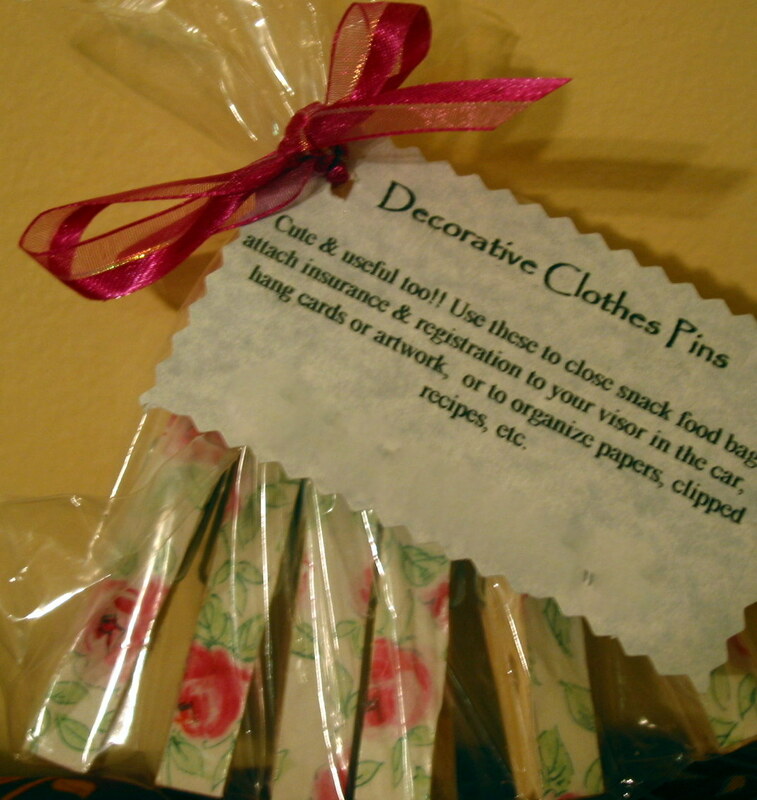 If using ribbon, cut a piece slightly longer than your clothes pin for each side. I like to use a coordinating ribbon on the second side - fun to mix things up! Brush the first side of clothespin with a layer of mod-podge. Apply paper, fabric or tissue. Smooth out any air bubbles, and let dry. 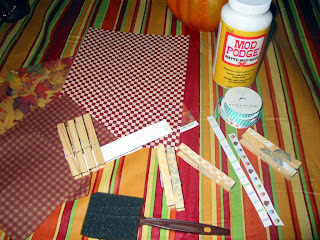 Once dry, apply a layer of mod podge over the top of the paper or fabric. Let dry. Repeat two more times. Then, flip over and do the other side exactly the same! (That is why I do at least 10, 20, or even 50 at a time because by the time I finish one side, it's time to do the next step on the first ones!) For the ribbon covered clips only: once the final layer of mod podge is dry, trim the end of the ribbon to match the length of the pin. With the mod podge on it, there should be no fraying!